Dine with Chef Rajeev at his private Chef's Table. Let him shower you with culinary insights, attention and one of the most remarkable meals of your life. This is a backstage pass into the Chef's world and we promise, you've never seen anything like it. 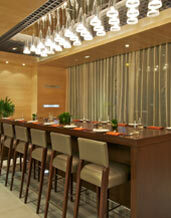 The Chef's Table is for a party of 8 to 10 and requires 24-hour advance notice for booking. It's twilight. The buzz of the hotel is in the distance. The table is set and your group sparkles with the pleasure of a private celebration. Create a moment that separates you from the crowd. Vivanta by Taj will help you arrange a private poolside table.